Spread over 2 days at the beautiful Westhope College in Shropshire, this course will give you an insight into the principles of designing images with values in mind. Ever wondered why one artwork sings whilst another just looks ordinary? The answer is in black and white! ‘Notan’ is a Japanese word used to describe the balance of light and shade in a painting. Although most of us are unaware of it, the pattern of light and dark in a picture is the single most influential factor in our appreciation of any artwork. Through a series of exercises and demonstrations we will learn how to design successful pictures every time. This workshop is a real must for anyone looking to improve their understanding of how to make a picture feel balanced, interesting and memorable. Using ‘notan’ you can determine whether a picture will succeed or fail in just 2 minutes! Painting is not just about creating pictures – it is about how we choose to apply the paint when we create pictures. Suitable for painters in oils and acrylics, this workshop will focus on how to make your artworks more expressive and painterly. Famous painters are often recognised by their brushwork; think of Van Gogh, Monet or Cezanne, this is because brushwork is the most personal and stylised aspect of painting. Through exercises designed to increase both confidence and ability we will learn how to use brushwork to create your own uniquely expressive, beautiful artworks. Starting with learning about various brush types and their uses we will then master a series of methods for applying both thick and thin layers of paint. The emphasis here is on learning how to create paintings with attractive, descriptive surfaces whilst maintaining the accuracy of the image. A playful, relaxed and informative day spent learning the art of painting with a knife. Using either oil or acrylic paints you will learn how to create the distinctive look and texture of a ‘knife painting’ through a series of simple, enjoyable exercises and demonstrations. Suitable for all levels. Take your control and understanding to a higher level with this 3 day intensive course on colour theory and colour mixing. With a technical, academic approach to colour, first, learn to accurately identify and mix colours using a reliable method that works every time. Then discover how to use colour to enhance your paintings in this useful practical workshop. Focusing on how we can employ colour within our work we will learn about the creation of harmonies and how to create a ‘palette’ that will express the mood of your painting more clearly. Suitable for learners in all media. Some previous painting experience is necessary to get the most from this course. What makes an image beautiful? This workshop will appeal to artists, photographers, designers – in fact anyone who wants to know how to turn hum-drum pictures into extraordinary images. Basic drawing skills are required for this course. A workshop on painting buildings in the landscape for members of Castle Arts Society in Birmingham. Do you find it difficult to achieve accurate colour? Or to make your paintings sing? Study with expert colourist and Michael Harding Paints ambassador Vicki Norman, on this exclusive course. Taking a technical, academic approach to colour, first, learn to accurately identify and mix colours using a reliable method that works every time. Focussing on how we can employ colour within our work we will learn about the creation of harmonies and how to create a ‘palette’ that will express the mood of your painting more clearly. Suitable for painters in any media with some previous painting experience. I'll be at the fabulous 25th Anniversary Patchings Festival with a stand full of lovely Michael Harding Oil Paints and plenty of inspiring artworks on display. 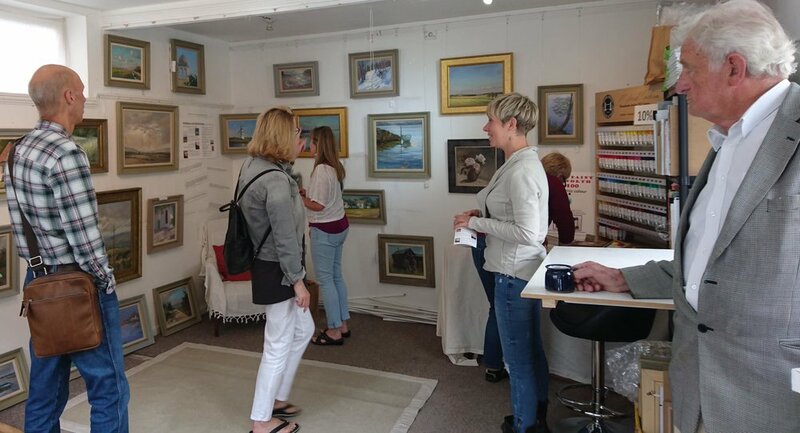 Come and chat about holidays, paintings and of course, the paints themselves! Suitable for learners of all levels in all media, this workshop is also excellent for photographers and designers. Now in the 13th year of documenting the landscape and culture of the last vestige of authentic "Old Florida,” Forgotten Coast en Plein Air, America's Great Paint-out, is among the world's most prestigious plein air events. Artistic excellence and the production of investment quality art continues to be the trademark of this 10-day festival. As the event moves into its second decade, organizers are honing what makes the Forgotten Coast event exceptional. “With plein air events popping up all over the country, we realize the importance of focusing on quality and relevance. We have developed a three year program, transcending typical event content to focus on the reason why plein air painting is important, as well as how the process and the paintings contribute to a region’s resilience,” states Event Chair Joe Taylor. May of 2018 will focus on the built environment. This human-made space in which people live, work, and recreate will showcase architecture, streetscapes, working waterfronts and historic sites. While each year will have a programmatic focus for the purpose of examination in the series of lectures, presentations and discussions, the collectors can be assured that the paintings will be a superb mix of subject matter and styles. Maximum of 12 students and a minimum of 6.